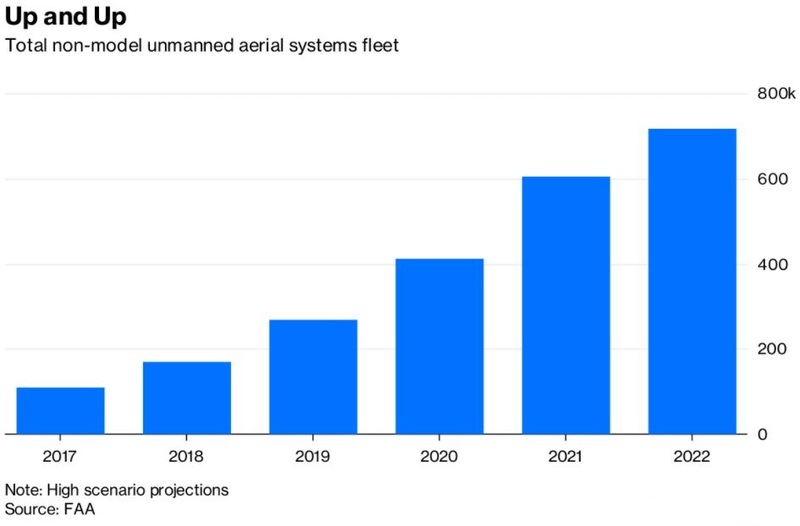 There are already 170,000 small, unmanned aerial vehicles licensed in the U.S., and the Federal Aviation Administration predicts another half-million more of them to be airborne by 2022. Drones are everywhere, doing all sorts of things, including delivering hamburgers and beer to golfers. They’re taking group photos, scouting properties and being shot down by neighbors. They’re also competing, and the competition is serious. Lockheed Martin Corp. has launched a $2 million competition pitting human operators against artificial intelligence in races through obstacle courses at speeds of more than 80 miles per hour. Tiny, sensor-laden electronics might sound like a game — but as Lockheed’s interest suggests, they should sound like business. Drones are being used today by grid companies to spot faults or overgrown foliage in transmission and distribution lines across the U.S. Monitoring overgrowth is increasingly important in hot, dry areas increasingly prone to fire — such as in Northern California, where PG&E Corp. may owe as much as $17.3 billion in liabilities from the 2017 fires in wine country. Drones were also used by Duke Energy Corp. to help restore power lines in Puerto Rico after Hurricane Maria knocked out 80 percent of the island’s electricity access. 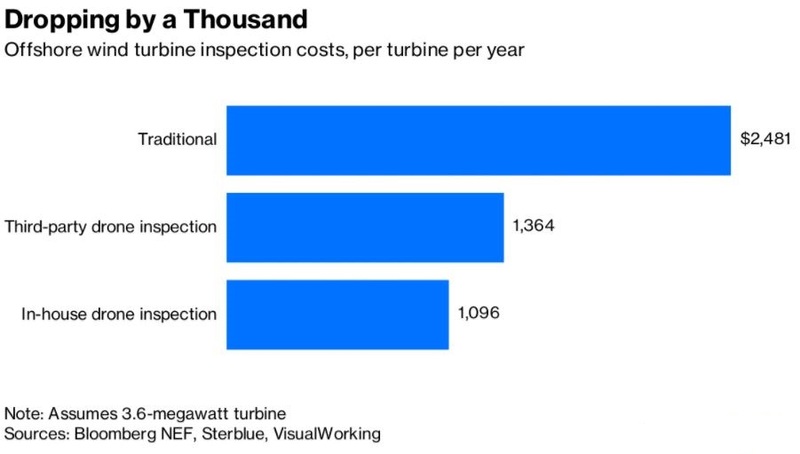 New research from Bloomberg NEF assesses the economics of drone inspections in power plants and oil and gas inspection. At offshore wind farms, drone inspection may prevent significant failures resulting in downtime and lost revenues. 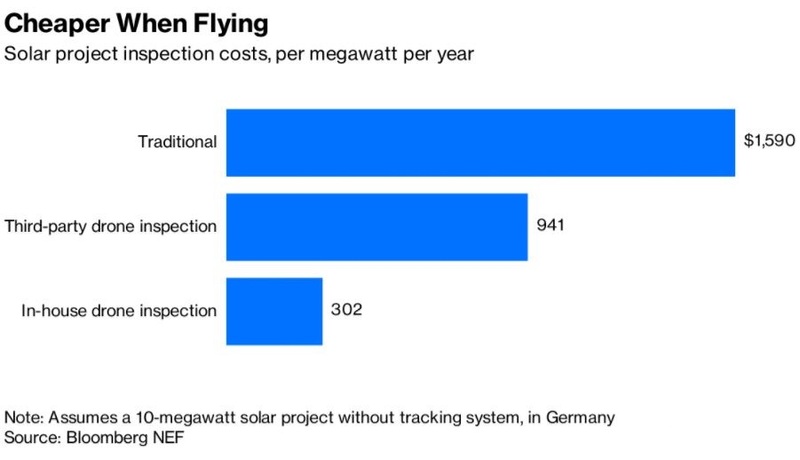 BNEF calculates that the use of drones on offshore wind farms in Europe could shave off more than $1,000 per turbine per year in inspection costs (reducing the cost of producing electricity by 1 percent). As drones improve, so will the services that they can provide. Drones that only collect video footage are limited to inspection. With machine vision, enhanced sensors, and grabbing arms and probes, drones may be able to fix minor faults in wind turbines, clear away overgrown foliage, and defend assets from intruders. Advances in 3-D vision and computational photography, cheaper communications networks, and lightweight batteries all promise to produce a drone that can fly for longer, act independently, and replace dangerous or boring human labor.